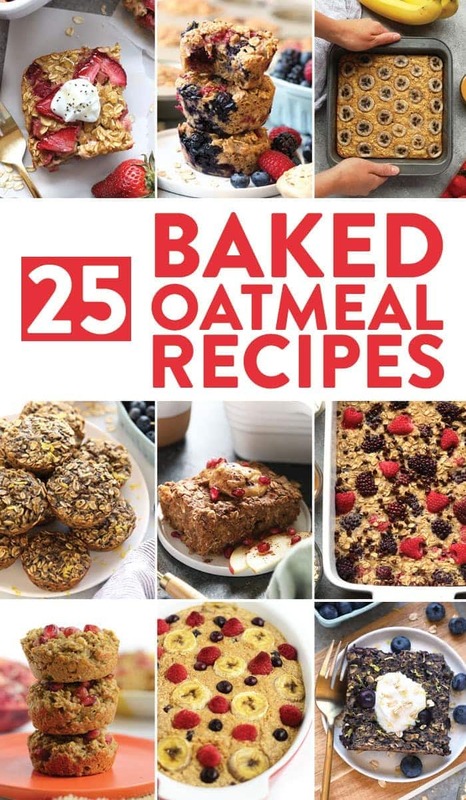 We love baked oatmeal here at Fit Foodie Finds and today we’re here to share some of the best baked oatmeal recipes and baked oatmeal cup recipes on the Internet + answer all of your oatmeal bake q’s! 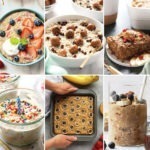 Baked oatmeal is my favorite way to eat oatmeal (here are 50 more ways to make oatmeal) because it’s almost like eating cake for breakfast. The texture is like a hearty bread or muffin (PS: these are my favorite healthy muffins right now) and the amount of good nutrition in one piece of baked oatmeal is amazing. I also love it because it’s a great breakfast meal prep idea that only takes around 15 minutes to prepare! I thought I’d walk you through how to make baked oatmeal…either in a casserole dish or as muffin cups. These two variations are essentially the same recipe, just different pans. 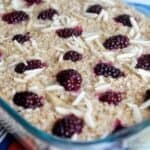 Oatmeal: we’ve made baked oatmeal with both rolled oats and quick cooking oats. You can pretty much use them interchangeably. 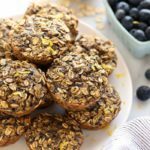 I’d say that rolled oats give you more of a “bite” kind of texture, where quick cooking oats are more muffin-like. 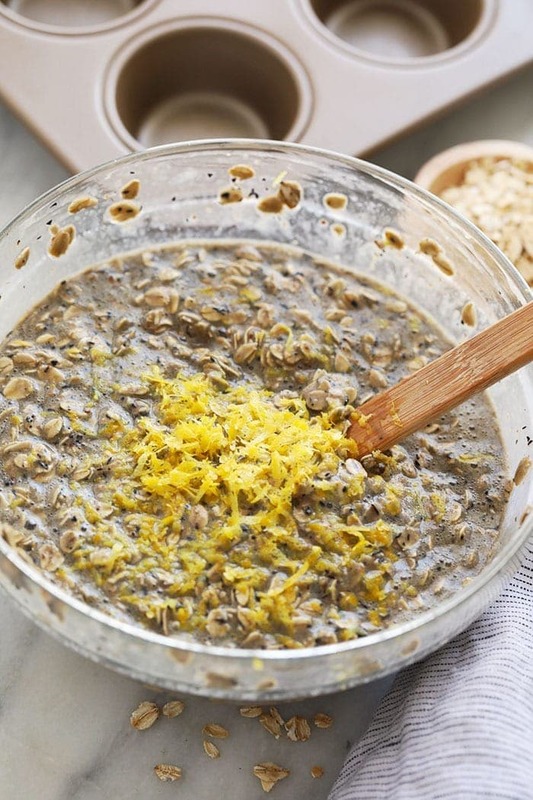 Eggs: eggs or an egg replacement like a flax egg are an important component when it comes to baked oatmeal. 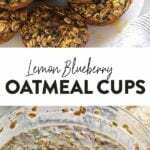 This is what gives the oatmeal the true muffin-like texture and it’s important you don’t skip this step! Fruit: most baked oatmeal recipes call for some kind of fruit. I love adding pureed fruit like applesauce or mashed banana so that I don’t have to add as much (if any) oil. Sweetener: our favorite sweeteners to use in baked oatmeal are maple syrup and honey. 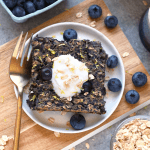 We like to keep things refined-sugar free, which is why we don’t use white sugar or brown sugar in our oatmeal bake recipes. Flour: some baked oatmeal recipes call for flour and some don’t. I prefer to use a little bit of flour, whether it’s oat flour or white whole wheat flour, because this also helps with that yummy, bread-like texture. 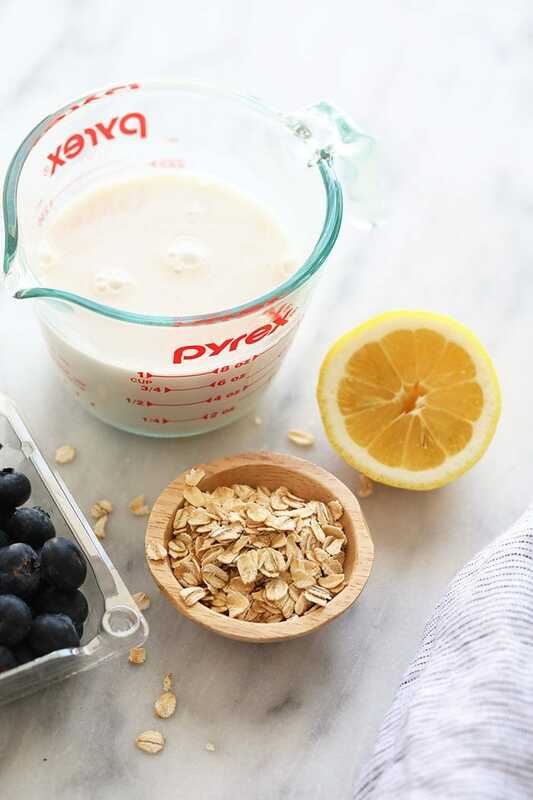 Milk: Liquid is essential in baked oatmeal and we love using almond milk. The great thing is that you can use any kind of milk 1:1 such as cows, soy, etc. Oil: Most baked oatmeal recipes call for some kind of oil and our favorite oil to bake with is coconut oil. Don’t forget to melt it before you mix it in! It’s no secret that baked oatmeal is baked in the oven. What really matters here is whether you are going to make a casserole of sorts or muffins! If you make an oatmeal bake casserole (~30-40 minutes) the bake time will be slightly longer than if you make baked oatmeal muffins (~20 minutes) and rightfully so. My main piece of advice when it comes to baking this glorious food is to make sure that you use a nonstick pan AND spray it with nonstick cooking spray so that you don’t have any sticking! Cooking tip: if you find a recipe that’s for normal baked oatmeal you can almost always bake it in a muffin tin to make baked oatmeal cups and visa versa! Storage: once your baked oatmeal has fully cooled, we suggest slicing your casserole into single servings and placing into a glass meal prep container. Same goes for the cups! Store your baked oatmeal in the refrigerator for up to 5 days. While you can leave your baked oatmeal cups out overnight, they will last much longer in the fridge! How long does baked oatmeal keep? If you store your baked oatmeal in the refrigerator in an air-tight container, it should last anywhere from 3-5 days. You can also try freezing your baked oatmeal for later and that should last around 3 months! Can you use instant oatmeal for baking? Yes! You can use both rolled oatmeal and quick cooking oatmeal in most baked oatmeal recipes. 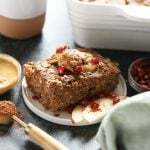 Should baked oatmeal refrigerate? While we suggest always refrigerating your baked oatmeal, it should be okay in the counter overnight. We do want to note that it will last much longer in the fridge than on the counter. Why is oatmeal a good breakfast? Oatmeal is a great breakfast option because it’s packed with fiber and a 100% whole grain. It will keep you fuller for a longer time. Can you leave cooked oatmeal out overnight? Yes, you can leave cooked oatmeal out overnight. Do note that we suggest refrigerating your baked oatmeal for the best results. 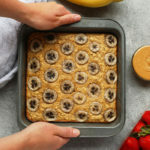 Because we can’t leave you without a NEW baked oatmeal recipe, feast your eyes on the latest and greatest below. 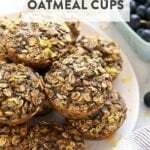 Baked Oatmeal Cups are such a great healthy breakfast idea to make for the entire week. 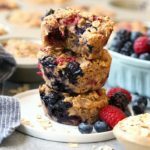 Our Triple Berry Oatmeal Cups are our most famous baked oatmeal cup recipe and these are a spin-off recipe that I know you will love. 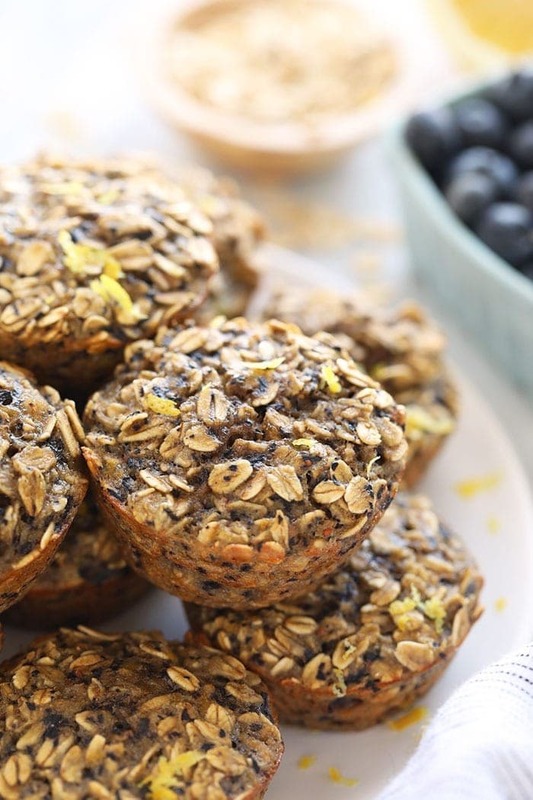 The tastiest little baked oatmeal cups you ever did see. 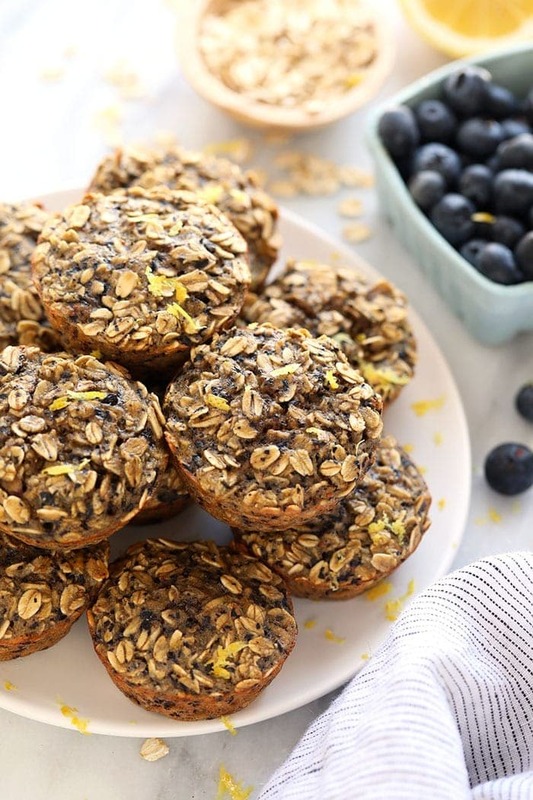 Your tastebuds are going to go wild for these healthy Lemon Blueberry Oatmeal Cups. Preheat oven to 350ºF and line a muffin tin with muffin liners. Spray with nonstick cooking spray. Place banana, blueberries, almond milk, and honey in a blender/food processor (or single smoothie cup) and blend until pureed. Set aside. 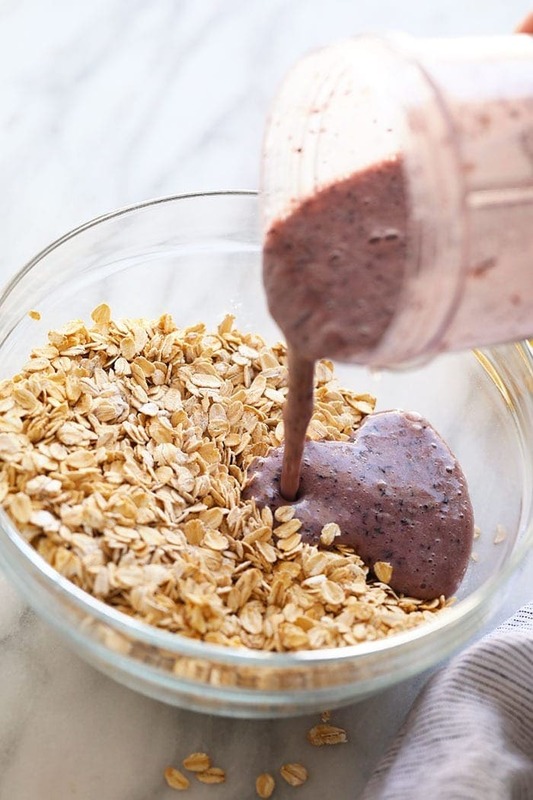 Add rolled oats and baking powder to a large bowl and then add in the pureed blueberry mixture and mix well. Add eggs, vanilla extract, lemon zest and salt. Mix well. Finally, add in 1 tablespoon of melted coconut oil and mix again. Scoop around 2 tablespoons of mixture into each muffin cup and then bake at 350ºF for 19-21 minutes.